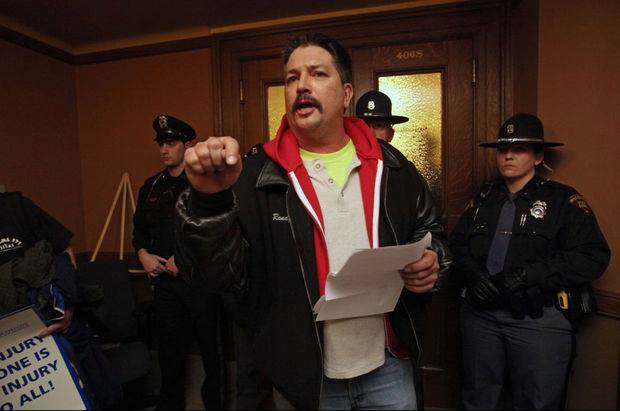 Despite single-digit and falling temperatures, some 300 Milwaukee unionists and their supporters rallied against anti-union “right to work” legislation being hustled through the state legislature this week. The Greater Milwaukee Green Party was an early endorser of the rally, to be joined by most of the area’s major unions, Wisconsin Jobs Now, Voces de la Frontera, and the Coalition for Justice. Nate Hamilton, whose brother Dontre was murdered by a Milwaukee police officer on April 30, 2014, spoke to the rally on behalf of the Coalition for Justice. 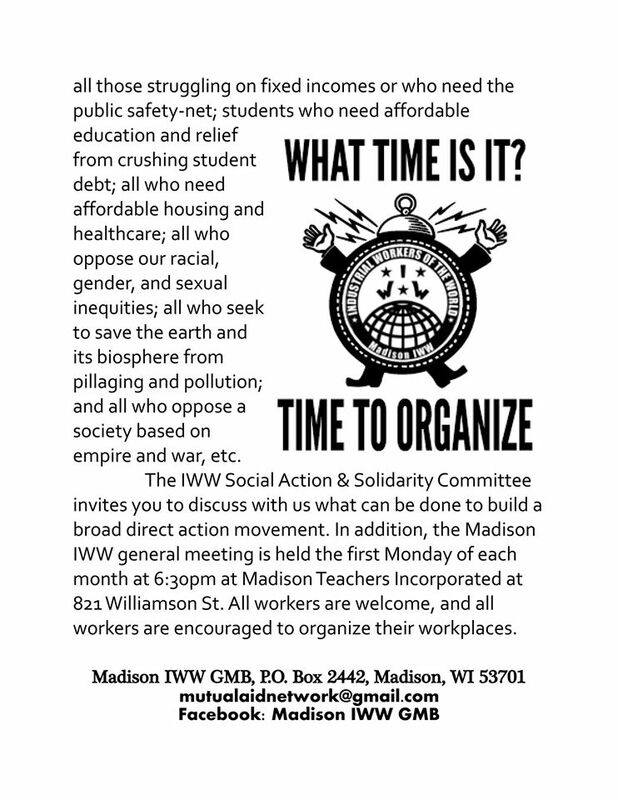 Angela Walker, who ran for Milwaukee County Sheriff as an independent socialist candidate last fall, spoke on behalf of Wisconsin Jobs Now. A representative of the UW-Milwaukee Graduate Assistants Association, which bargained on behalf of teaching assistants at the UWM campus, before Act 10 banned collective bargaining for public employees in Wisconsin. He noted that if this bill passed, the union movement would be back to Square One. He argued that learning from the militant (and politically independent) tactics of early 20th century unionists would be valuable going forward. Following the speakers, demonstrators took to the streets of Downtown Milwaukee. The peaceful, spirited march made it around the Grand Avenue mall, past the Chase Bank building, and back to Zeidler Union Square, where activists were urged to continue the action in Madison over the next two days. My name is Randy Bryce. I have been a member of Ironworkers Local 8 since 1997. I’ve had the privilege in that time to work on many of Wisconsin’s landmarks, private businesses, and, numerous parts of our infrastructure. One day, a friend of our family – a physician who had a patient that was the former ironworker apprenticeship coordinator let me know that the ironworkers were taking applications. I hated the job that I was at. It was in a dirty warehouse, and, I dreaded going into work every day. I applied. I had never done construction work before. After going through the application process, I finally made it onto the apprenticeship list. I’m not going to go into great detail explaining how my apprenticeship went, because I understand that this body has a bill that they’d like to ram through before the rest of the state is aware of how horrible it really is. I’ll be as brief as possible. Fact is, the ironworker’s apprenticeship has the ability to take unskilled people off of the street, and, gives them a career that they are proud of. They taught me everything that I needed to know in order to now have a career that not only takes care of my family, but, has me proudly pointing out every project that I worked on as I drive throughout the state to my son Ben. That training isn’t cheap. But, WE pay for it through our union dues, and, from contributions from the contractors who hire us. The apprenticeship board consists of 5 union reps, 5 contractor reps, and, a rep from the state who meet monthly. Zero tax dollars are used. After passing the #WageTheftBill (lets not pretend that this bill involves rights or the ability to work) Michigan has found out that it is now lacking with skilled trades workers. They will soon be using tax money to train workers. This horrible attack on the Building Trades is not good for anyone in the state. It is a blatant attack due to political ideologies. Sen. Fitzgerald admitted such when this idea was first mentioned when he sought to exempt certain unions who supported Republican candidates. (Unconstitutional) Proponents have admitted that it will not raise wages. I am sure that you are all aware of the Wisconsin Contractor coalition – a group of around 400 private businesses – many of who donated heavily to Republican candidates – who are opposed to this bill. They see it for what it is – the government getting in the middle of how they hire their help. We make those contractors a LOT of money. They CHOOSE to use us. Another aspect of what is trying to be sold is that this bill gives workers a choice. There already is a choice. If somebody wants to do what I do for a living, there are plenty of open shops that already exist. People are free to go work there. They won’t get the same training that our union dues pay for, and, they probably won’t make the same amount of money as a result, but, they exist. Their lessor wages are what I refer to as their “nonunion dues”. It’s the cost that they choose to be paid for not joining a highly skilled workforce. The ironworkers created the first union in order to pool money together in order to give someone killed on the job a decent burial. Because of what we saw that could be done by looking out for each other, we were able to demand safer working conditions. Our trade is annually listed among the top 5 with regard to having a high mortality rate, but, it is a lot better than it used to be. The union that I belong to is self insured. We get no sick days or holiday pay. As stated before, we pay to self train. Our instructors are experienced journey men ironworkers.There is ZERO burden on the taxpayer. The 4 year apprenticeship has members graduate with no student loan debt. Once graduating to Journeyman status, one can work anywhere in North America with a network that has been set up to attract skilled labor when an area faces a shortage. We have no seniority. If you don’t work, you don’t get paid. Our vacations are taken understanding that we will not get paid for the days that we are on vacation. All of our representatives are elected. All of the decisions that we make are voted on. The general membership is given monthly reports on how every dime is spent. Every dime spent is voted on. Unlike what is taking place this week, Ironworkers local 8 is PURE. DEMOCRACY. Every single member of the legislature is cordially invited to come view our training facility. When running for state senate, I made it a point to invite members of the opposition party to see what we do. I am disappointed beyond words at not just what this bill contains, but, how it is being passed. I am proud to be among those who build Wisconsin. My job is construction. This bill is demolition. Thank you for the opportunity to speak my mind. Because I belong to a union, I was able to take off of work today and not fear that I would lose my job. ALEC’s policy agenda requires a bit of acrobatics. Members feign attention to the “principles” of free markets, limited government, and federalism, but really use a diverse set of conflicting ideological props as needed to justify the often-concealed agendas of their corporate sponsors. For example, local control leads to a proliferation of local governments and districts, each requiring care and feeding by the public, a widespread but cherished form of “big government”. So ALEC puppet masters can invoke limited government or local control with opposite effects, depending on the circumstances. I spent this morning calling local chambers of commerce in Republican state senate districts in an effort to get their take on the so-called “right to work” legislation that is scheduled to be introduced at the State Capitol this week. Since the State Chamber of Commerce, or WMC, is strongly supporting the legislation, I was curious to learn where local business associations stand on the issue. Specifically, I wanted to learn the answer to this question: Is WMC really representing Wisconsin’s broad and diverse business community when it claims that businesses want legislators to enact “right to work” laws? Milwaukee Rally to Stop “Right-to-Work” at 5 p.m. Today. 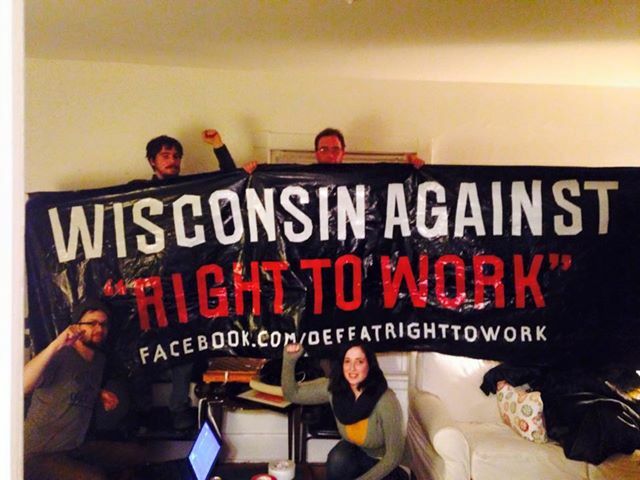 We say: NO “Right to Work” for Wisconsin! Plans to introduce so-called ‘Right to Work’ legislation are threatening to make Wisconsin the 25th state to eliminate all union contracts with mandatory dues as part of employment. This weakens working people’s right to collectively bargain for better wages and decent working conditions. So-called “right to work” states have much lower pay, workers make nearly $6,000 less per year. Workers also face 54% more workplace fatalities, 15% higher poverty rate, and 16% fewer health benefits, to name a few. 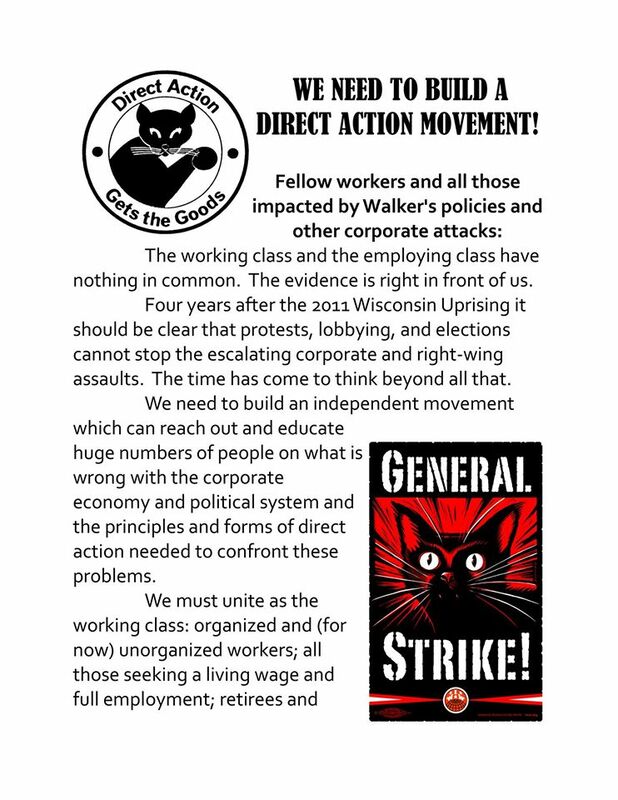 Worker’s are ready to fight ‘Right to Work’ because ‘Right to Work’ is not about democracy or choice, it’s an attack from big business on the working people of Wisconsin.